David Jones, whose primary material was paper, always preferred to work from the comfort of his own room. I always work from the window of a house if is at all possible. I like looking out on to the world from a reasonably sheltered position. I can’t paint in the wind, and I like the indoors outdoors, contained yet limitless feeling of windows and doors. A man should be in a house; a beast should be in a field and all that. I have to try and paint now. I paint trees from my window. It’s part of the creative game, as, in their judgment, I’ve now reached a period when I must paint, because they maintain that my major conflict displays itself in reaction to painting and it must be fought out in that terrain – that’s not the whole story – but a very different part of it, whatever the inclinations, results, difficulties, feelings etc. etc. Residential life suited Jones’ sheltered practice; he was to stay as a resident boarder in Harrow for the rest of his life, in Northwick Lodge until 1964, then Monksdene Residential Hotel until 1970. Brief Record is a slight sketch. Pencil strokes move faintly from top right to bottom left, drifting across the paper as if in tune with the direction of the breeze. Yellow chalk lends the image a warm glow. Whereas Jones’ interest in British history resulted in drawings that from this time were increasingly dense, this sketch speaks of his abiding love of the natural world. 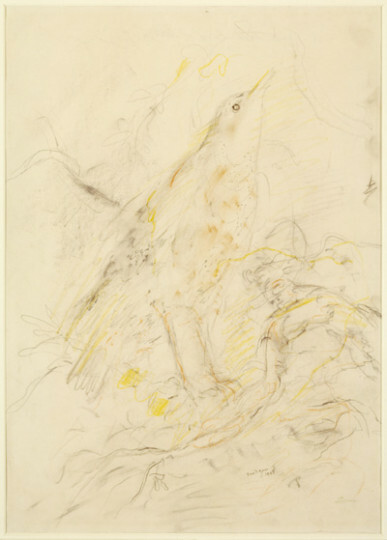 It looks back to a series of drawings made in London Zoo between 1930–31, and even further, to the animal drawings in his earliest existent childhood sketchbooks: Leopard and Tiger or Lion (both 1902), or the drawing made as a seven year old that he professed to prefer to anything made later, Dancing Bear (1903).